I've been on the hunt for a super frugal and easy option for a compost bin. 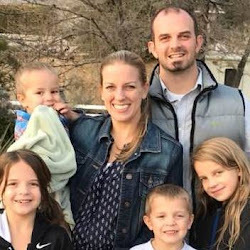 I stumbled across this post with the easiest and cheapest option I had seen. I quickly got to work emptying out a large tub that I already had in my garage. So, this project for me was completely FREE! Creating your own compost is super easy to do, and will frugally help to enhance your garden. Adding compost to your garden soil helps to improve the soil and adds tons of vital nutrients to help grow healthy plants. Compost is a great additive to both dry, sandy dirt and to hard, clay-like dirt. It will turn it into nice, rich, nutrient dense soil, great for all your plants. Look around your house for a large, dark tub (don't use a clear tub). It doesn't have to be in perfect condition, but it does need to have a lid that snaps on securely. 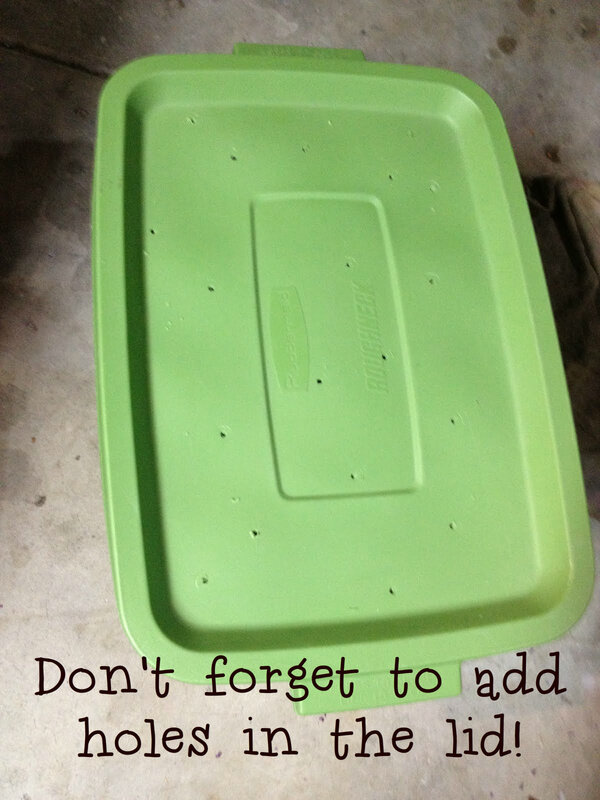 Small cracks are also okay as you will be adding many holes to the tub anyway. If you don't already have a tub that you can re-purpose, you can find these tubs at stores like Target or Walmart for around $5. 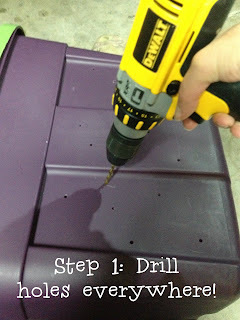 Using a drill, begin to drill holes everywhere! They can be completely random, just make a bunch of them! 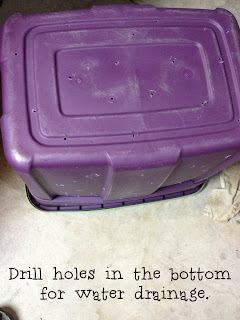 Be sure to add holes to the lid to allow for rain absorption (saving even more money), and to aid in circulating the air. 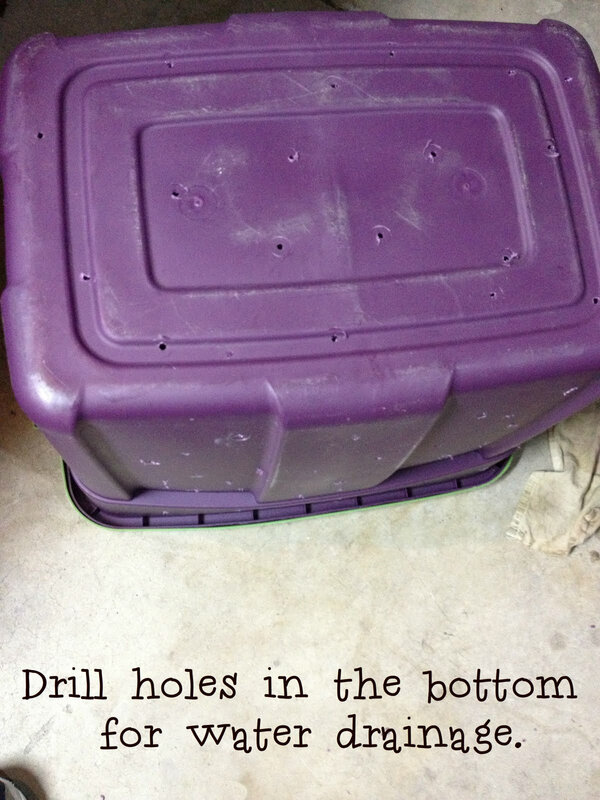 Ensure that there are plenty of holes drilled into the bottom for proper water drainage. Lastly, add some dirt! 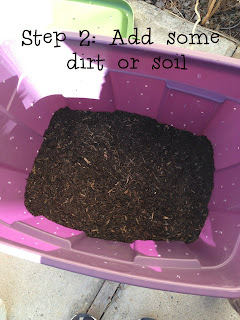 This can be excess dirt from your yard, or even a small, cheap bag of soil. I used old soil from a planter box that I've been trying to empty out of last years' soil. I filled about 2 inches with dirt. Now all you have to do is add scraps! You can basically do anything that has been grown (veggie scraps, cores, banana leaves, etc.) or waste from your yard (leaves, plant clippings). Egg shells are also okay. Avoid pine needles in large amounts as they decompose slowly. If you add lots of fresh green grass/yard clippings, be sure to balance it out with browns/dry stuff from your yard or else it will get stinky! When adding food scraps, chopping them into smaller pieces will speed up the decomposition. DO NOT add anything dairy, any pet droppings, litter, lime (too high of pH), meats, fat, greases or oils, or coal or charcoal ashes. If your pile is not decomposing fast enough, or if it begins to get stinky, it means you have an imbalance in the nitrogen to carbon ratio. You can read more about maintaining those ratios here, and you can read about a list of nitrogen and carbon composting items here. Finally, anytime you add scraps to your tub, be sure to give it a good shake up! You should also add a small glass of water to the mixture. You want your pile to have moisture, but not be super wet. A cup of water each time you add stuff will help maintain good moisture. 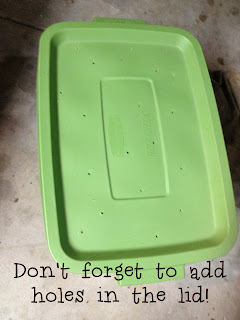 It sounds as if this particular method (tub with holes) will yield a ready compost in 4-6 months. I am so excited to start and use this new frugal, and environmentally friendly aspect in my garden! I am storing my bin just outside my back door for easy access from my kitchen. Have fun! Looking for my DIY garden projects? Go HERE to learn how to re-grow celery, or HERE to use that celery to stamp roses! 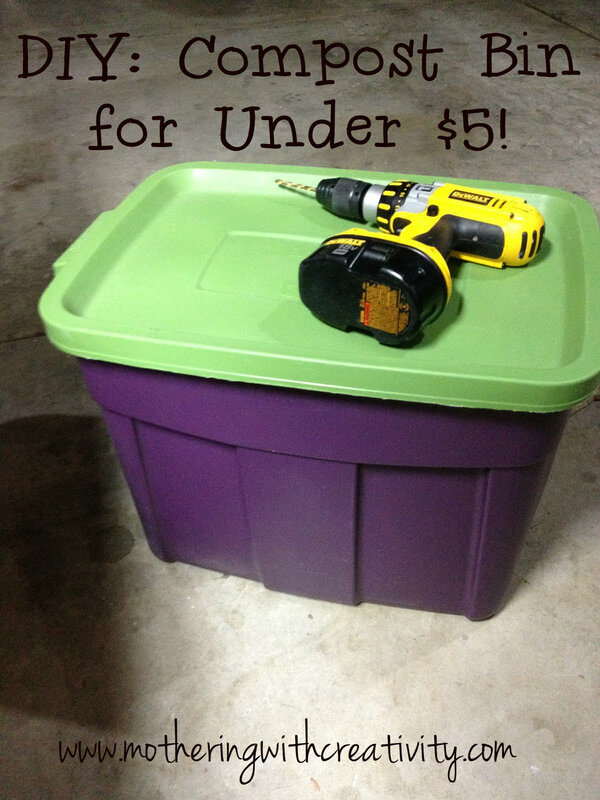 Check out my first DIY planter box HERE! Update (4/5/14): It's been 1 year since I made this bin and started my first compost pile. Sometime in the fall, I stopped adding stuff to my pile and just let it sit. About once a week through the fall and winter, I would give the tub a little shake. If it looked dry, I'd add a cup of water. A couple weeks ago, I dumped the compost into one of my garden beds. It was AMAZING! So rich and moist. I only found one avocado peel that had not quite decomposed all the way, but it was easy enough to pull it out. I've started over with my $5 compost tub, and I'm thinking I may actually start a second one this year, too! I am a Green Bean when it comes to composting and have been searching the internet for a realistic solution/set up. This doesn't look too hard, I'm going to try it!